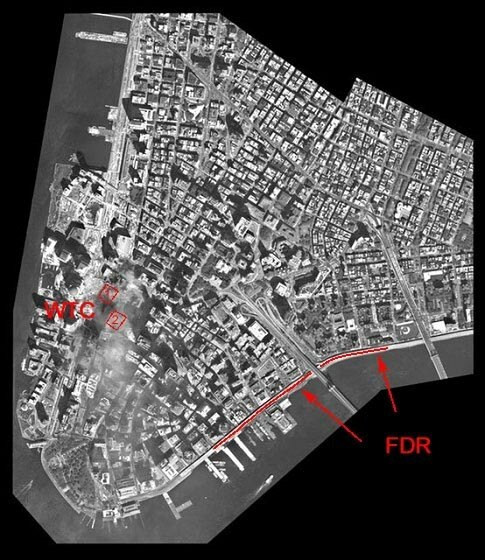 Blocks From WTC On 911? Figure Map. Areal view of lower Manhattan. 1. I welcome commentary from those who lived or worked within the blast/damage zone and have something to substantiate their claim. 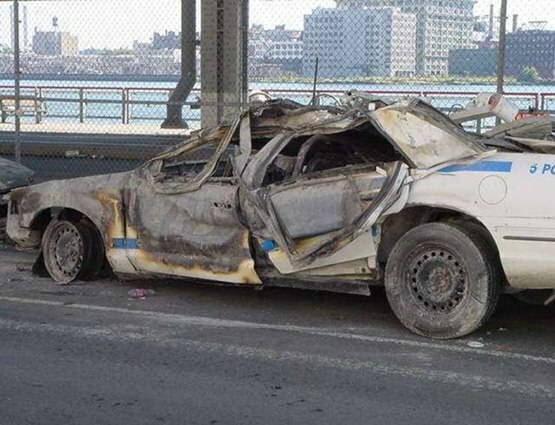 It is very important to discover and see evidence of melted metal in buildings between the WTC and damaged vehicle locations. 2. Destroyed computers, radios and televisions electronics from an EMP pulse are important evidence to support the theory. This was only briefly mentioned in the article. It is not currently known whether an EMP was present in conjunction with a magnetic pulse. If you have a destroyed piece of equipment from that day you can contact me about where to ship it. I'll analyze it and give you a report on exactly what failed. 3. Seismological recordings are already on record showing another explosion occurred when at least one plane hit. This information was publicized years ago, and was probably the weapon that insured the building(s) would come down. If two such weapons detonated at exactly the same time, it may appear as one event on a seismological recording unless an interferometer method was employed using 2 or more recordings at distant locations. 4. There is an email spammer out on the web using data4science.net website to generate bulk spam emails (big surprise.) These emails do NOT originate at my webserver, and I'm receiving them as well. Our email server for the website does NOT have public bulk email software. Our webmaster wrote his own secure emailing program for the server that only sends out occasional newsletters to volunteers only. The program cannot be remotely activated. Kiddy-hackers easily mis-configure any number of bulk email programs and popular email programs such as Outlook Express, Eudora, etc... to put any person's name (or website) as the sender. Data4science.net highly values the contributions of volunteers, and in no way would transmit spam to anyone. 5. The article is not meant to be the only possible explanation. The title cautiously states that it is only a POSSIBLE explanation. It is mainly intended to get people thinking about other events of that day. And based on the positive response I've received from many readers, it has accomplished that. 6. Using the images from another website may or may not have been a mistake. Some readers are certain that the two rows of vehicles in the parking lot shown were moved there. However, there isn't any photographic evidence to support this. Undisturbed dust UNDER the vehicles shows these vehicles were there all along since the collapse. For those who are sure they were moved, consider these facts: And if the vehicles were moved, would any tow truck driver go to the trouble to "sort" the vehicles in a such a way to move them to the parking lot shown, orienting them all the same way and grouping them according to damage? When there were hundreds of destroyed vehicles to be moved? Tow-truck and flat bed drivers are paid by the vehicle, and the more vehicles they move the more money they make. A totaled vehicle is still a total loss and not worth sorting. 7. My apologies for the typo about the definition of a Giga-watt that passed by me. 1 Giga-watt = 1,000 million watts. 8. Please do not waste my time or yours writing me hate-spam emails. These will no longer be read or responded to and will be auto-deleted. People who love mainstream network news and believe every word they hear are usually the writers of such trash. I still welcome your constructive thoughts.